Grain SA held its annual Congress early in March this year. It was well attended by farmers who were sent as delegates from their regions. 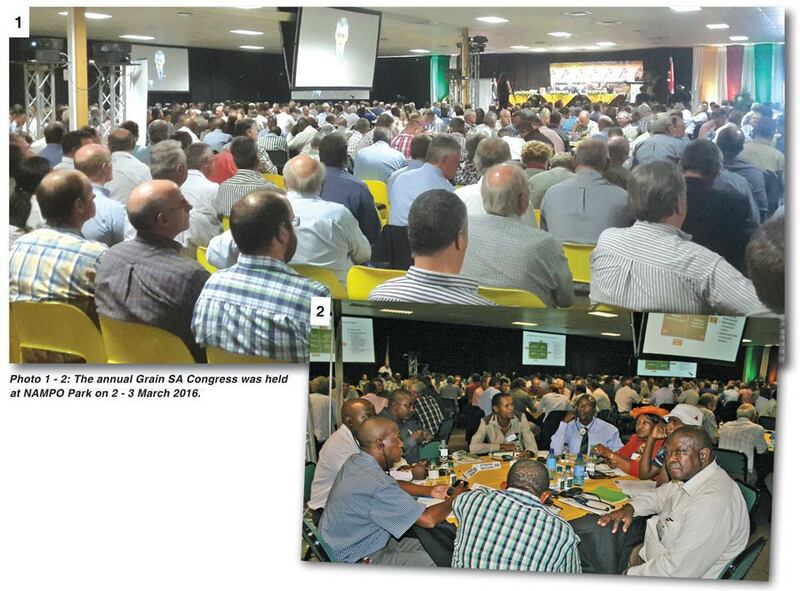 Many farmers understand the process but some newer members of the organisation may be wondering how it is decided who gets to attend Congress as a delegate. What is Grain SA and how does it work? Grain SA is a voluntary association of grain farmers. This means that farmers in the business of grain production who share common interests, can decide to join up as members by paying the required membership fees/levies as decided upon by the Congress. The mission of Grain SA is to provide support and services to grain producers but also to represent the combined voice of grain producers to address commodity issues as well as matters with government and other role-players in the sector. This support is diverse and involves monitoring all matters which have an influence on the well-being and sustainability of the sector – from inputs to tariffs, diesel rebates, research and development projects and government policy which affects the agricultural sector. Clearly if farmers have experts working for them full time, a team which is monitoring the business environment and acting as a watch dog when necessary, it means that farmers are better positioned to concentrate on their own farming. This is why it is so very important to have such an organization in place. In fact it is common practise for different commodities to have similar interest-group organisations. So Grain SA is basically like an exclusive club. Members pay ‘membership fees’, which we call ‘levies’. This gives them access to the privileges and benefits produced by the organisation and they earn the right to influence decisions of the body through a constituted and democratic process. Grain SA is a voluntary association of grain farmers established to represent the interests of its members. Grain SA wants to be recognised as an autonomous and independent grain producers' organisation. It wants to be involved in all matters bearing on the wellbeing of the industry and to be consulted about policy issues relating to the industry. Grain SA is strongly apolitical and issues are dealt with only on merit and sound business principles without any party political consideration. Grain SA is controlled by farmers for farmers and structured to ensure members' democratic control over their elected office bearers. Any grain producer, who produces grain for marketing, who pays the prescribed membership fee or levy to the organisation and who supports the objectives and Constitution of Grain SA, can be a fully-fledged member of Grain SA. In Grain SA’s Farmer Development programme there are two levels of membership. The first is the ‘Study Group Member’. A study group member must be a farmer who produces less than 250 tons of grain. All other members must be farmers who produce grain for marketing. Study group representatives from each of the regions are nominated annually to serve on the Farmer Development Working Group. The term of office for these study group representatives on the working group is one year, and these persons are eligible for re-election for a following term after the year term. Study group representatives who are nominated from their regions to serve in the working group have the power to vote in the working group. Study group members are not delegated to attend Congress. Every study group has at least ten members who produce grain and each farmer may only belong to one study group. This is different from the levy paying member and is a special dispensation agreed to by Congress. This is because it is the intention that the organisation is more inclusive by including and giving a voice, to small scale producers and developing grain farmers; and to consciously empower them through the skills development, training and mentorship. The aim is to help every individual who wishes, regardless of the size of his or her operation, to farm their land in the best way possible and to achieve the best production possible. The long term goal is to help those farmers with potential to become fully commercialised. These farmers are recognised by the numbers of tons of grain they produce and become ‘250 Ton Club Members’. In fact many members of this club are producing much more – some produce up to 1 500 tons. These farmers effectively graduate from the farmer development programme because they are successful New Era Commercial Farmers. Grain SA hopes all these farmers will join the organisation as full levy paying members and participate in the structures. 250 Ton Club members produce more than 250 tons of grain a year, pay the full membership fee or levy and endorse the objectives of Grain SA. Members of the 250 Ton Club may be delegated to attend Congress. To serve on the National Executive of Grain SA a farmer must be an elected delegate to Congress and must ‘earn a substantial portion of his farming income from the production and marketing of grain. (12.3). It is very important to understand that the Congress is ‘the highest authority of Grain SA’, according to the organisation’s Constitution. People often make the mistake of thinking that it is the national executive and the steering committee which are the highest authority whereas this is not the case at all. This is significant and makes it even more important for every member to carefully consider who to nominate as delegates from their region and who will best represent farmer interests at the Congress. Delegates have the responsibility of voting on very important matters which influence the activities of the organisation in terms of work done, leadership of the organisation, and even changes in the Constitution. Your delegate must be a bona fide farmer producing grain to market, a person who knows farming issues in your region, who is able to understand the business of the organization and who will speak up for your interests. The farmer who attends Congress as a delegate must be a leader who will be your voice to the general meeting and who will return home to tell farmers in your region what was discussed and decided there. Your regional delegates are essentially your champions at a national level. It is important to note the special dispensation included in the Constitution regarding New Era Grain Producers which was laid down as a sign of Congress’s intention to integrate with black grain farmers: ‘With regard to delegates from commercial black grain producers to Congress, a delegation of 32 (thirty-two) shall be allocated. These delegates shall not be determined on the basis of production or the payment of the commodity levy in their regions’. – (Note: This applies to delegates to Congress but not to members elected to serve on the National Executive). ‘The 250 Ton Club shall annually elect thirty-two delegates to Congress, during the annual meetings held before Congress. 16 delegates shall be elected from the eastern service area and 16 delegates shall be elected from the western service area. The delegates appointed to Congress must satisfy the qualifications for membership as stipulated in article 5.1.4’. 5.1.4.2 Pay the stipulated membership fees and commodity levy to Grain SA; and 5.1.4.3 Endorse the objectives of Grain SA; qualify for membership of Grain SA. 5.1.4.4 Membership is obtained in the manner set out in the Regulations. 5.1.4.5 Members of the 250 Ton Club may be delegated to attend Congress. All the delegates to Congress will vote for the key leadership positions of one chairman and two vice-chairmen. The delegates to the Congress have the responsibility of voting for one representative per region to serve on the National Executive. The National Executive is the highest authority when Congress is not in session, and, subject to the control and general policy of Congress. The members of National Executive then choose special areas of interest in which they will serve the organisation such as the different working groups. They also elect a Management Committee. In order to conduct the day-to-day affairs of Grain SA, the Executive must elect from its ranks a Management Committee consisting of the chairperson and 2 (two) vice-chairpersons of the Executive and at least 3 (three) additional members, with such powers as the Executive may delegate from time to time. The Management Committee exercises all the powers of the Executive when the Executive and Congress are not in session but are at all times subjected to the authority of the National Executive and the highest authority of Congress. In future we will take a closer look at the different departments and functions of the organisation. It is in the best interests for all farmers to understand and nurture our organisation so that it can effectively fulfil its vision to protect the interests of all farmers in a competitive global marketing environment, while facing many challenges of change on political and environmental fronts.